Here’s a terrific children’s book to add to the library of any young girl (probably 7 to 11), whose found herself alone during the summer without her best friends. 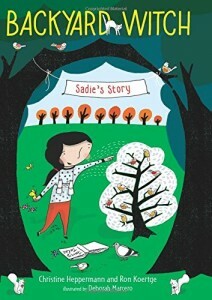 With a little imagination, and the help from the Backyard Witch, “a most magical and mysterious visitor, who always appears just when you need her,” Sadie’s summer, and her own sense of self-worth is transformed. The sweetness of this children’s book is how the witch treats Sadie, recognizing both her competency and her fears, and allowing her to shine. And while there’s a lovely message in the book, everything is done with a light touch and a wonderful dose of humor. Magic is a wonderful element in any book for young readers, and when the magic is both simple, and mysterious, we get a special lift in our heart. I would hope that boys would read the book too, but the fact that the main character is a young girl, and her two best girl friends, reduces the appeal. There’s already a second book in this same series, and I look forward to reading it as well. This is a great find, especially for new readers. The reviews on Amazon compare the series to Ivy and Bean, though personally I thought this story had more substance.